My perfect Saturday morning is a hot cup of coffee with the works and a warm fall flavored scone. 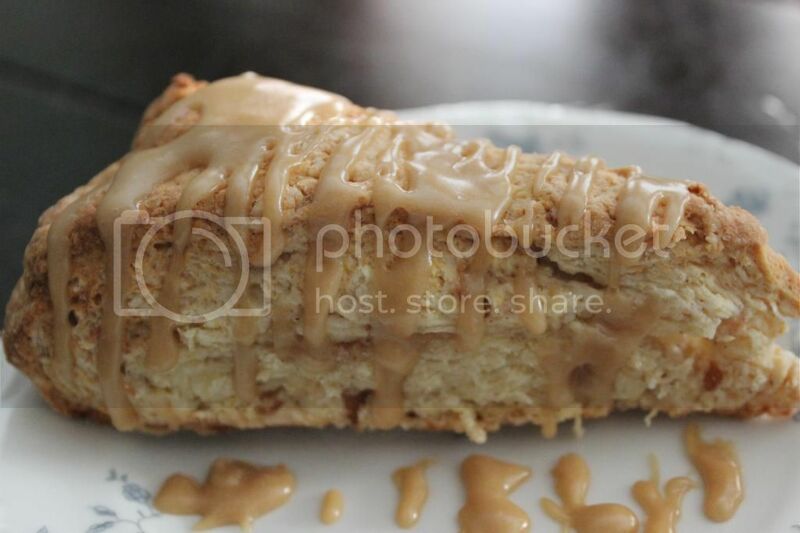 I have been making scones for years, the pumpkin kind, but when I saw a recipe for a caramel apple version, I knew that I had to make it. It’s finally September here, but the weather is still screaming middle-of-July-summer here. I need something to bring me into that fall mood that I am craving once school and football season starts. 1. Preheat oven to 350 degrees and line a large baking sheet with parchment paper. 2. ::apples:: Melt the butter over medium heat and add the apples. Cook about 4 to 5 minutes or until the apples are softened. Add the cinnamon and stir together. Pour into a small bowl and set aside. 3. ::scones:: Mix together the flour, sugar, baking powder, and baking soda. Add the butter and use a pastry cutter to mix together. Your looking for a wet sand texture. 4. Stir in your apples until your dough comes together. Do not over mix! 5. Pour your dough onto a lightly floured surface and form a 14×4 inch flattened log. 6. Using a sharp knife cut your dough into triangles. You should get about 12 of them. 7. Put the triangles onto your baking sheet, leaving about 1 inche in-between each one and bake for 15 to 18 minutes or until they are cooked through. Allow them to cool for a few minutes before moving them to a cooling rack. 9. Stir in your vanilla and the powdered sugar. Beat with a mixer until smooth. Drizzle the icing over the warm scones. Looking for another yummy scone recipe? Try our Iced Pumpkin Scones with a Cinnamon Spiced Drizzle. ::apples:: Melt the butter over medium heat and add the apples. Cook about 4 to 5 minutes or until the apples are softened. Add the cinnamon and stir together. Pour into a small bowl and set aside. ::scones:: Mix together the flour, sugar, baking powder, and baking soda. Add the butter and use a pastry cutter to mix together. Your looking for a wet sand texture. Stir in your apples until your dough comes together. Do not over mix! Pour your dough onto a lightly floured surface and form a 14x4 inch flattened log. Using a sharp knife cut your dough into triangles. You should get about 12 of them. Put the triangles onto your baking sheet, leaving about 1 inche in-between each one and bake for 15 to 18 minutes or until they are cooked through. Allow them to cool for a few minutes before moving them to a cooling rack. Stir in your vanilla and the powdered sugar. Beat with a mixer until smooth. Drizzle the icing over the warm scones. This looks perfect for fall. Hope you get some cooler weather soon. Me too! Watching The Weather channel while getting ready this morning and saw that the Northern states were seeing temps in the 50’s this morning…makes me wish that it would hurry up and get here! I know this post is pretty old, but I’m just wondering, does the Greek yogurt go in at the same time as the butter? Hi Autumn, You’ll add it when you add the apples.